The fine for improper parking in an accessible space is $100. Identifiable by the use of the "wheelchair" logo painted on the asphalt and/or posted signs. 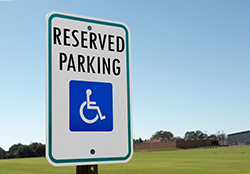 Reserved for those with a registered accessible parking permit or license plate. The permit must be displayed on the dashboard or sun visor and can be moved from vehicle to vehicle. Vehicles displaying an accessible parking permit may also park in time restricted spaces and the time limit will be waived. For more information on accessible parking please contact 970-221-6617.